Father Soresina records the reaction of those present at the Zaccaria's speech: "Such were the words that issued from that angelic mouth of this father, all heated with Divine Love, that he set their hearts aflame, such that all were compelled to lose themselves in the heat of Christ that was penetrating to their cores, and in this way they took to the holy road." Father Anthony" inflamed us all in such a way, that we threw ourselves to the ground in a profusion of tears and widespread promises to persevere; and with our hearts swelling we promised God that we would walk the road of scorn." The Exhortation of October 4, 1534 (or Sermon 7) was delivered by Anthony Mary on feast of St. Francis of Assisi. Anthony Mary exhorts his companions1 in the wake of bitter accusations, threats, and persecutions from evil and worldly people. To understand the nature of the persecutions against this newly born Order ( Barnabites) it is necessary to acquaint ourvelves with the historical background of that year. The "many difficulties" and the "opposition of the lukewarm" were not late in coming. It must have appeared strange to the Milanese to see Anthony Mary suddenly come out of Santa Caterina de' Fabbri one summer day of 1534, grasping a Crucifix in his hands and speaking of Christ to the people who gathered around him, even if only out of curiosity. It was a sign he meant to give to his collaborators: they had to challenge the people in the street, to try to engage them emotionally, in a violent and provocative way. They all complied soon enough, going here and there, standing before church doors and at the crossroads of the busiest streets, pointing out Christ Crucified to the passers-by and beseeching them to change their lives. Morigia, Ferrari, and several laymen appeared in rags, in a sign of open disapproval of the luxury in which they had lived before. Some begged for alms; others entered the Duomo bearing a heavy cross on their shoulders, imploring forgiveness for their sins. Though some Fathers were of noble family, they did not hesitate to subject themselves to the strangest humiliations; the mortification imposed on Gianpietro Besozzi (future Father General), who entered the congregation after leaving his wife (she would join the Angelics), his son, and his legal practice, will remain classic in the history of the order. Still in his secular clothing, he was sent before the church of St. Ambrose with a cloth dress and bowl to beg in the company of the other poor. The impact on the observers of this unexpected sight was double: some, struck by the fiery words of Anthony Mary and his companions, reflected and gave thanks for the jolt they had received, ending up at confession to begin their path to conversion. Others, by contrast – as Soresina confirms – derided these "crazies," who, among other things, received insults and mockery with joy, without the slightest contrary reaction. The affair made more of a sensation when women joined the group; they were headed by Countess Torelli, humbly dressed in a smock and a black veil on her head. They walked slowly through the streets of the inner city, braving the scorn of the rabble that threw rocks, mud, and garbage at the strange procession. Countess Torelli stood begging for charity in front of the main entrance of the Duomo. But she did not stop at that: one day she appeared so-dressed before Duke Francesco II Sforza, naming herself, however, by her title. The members of the court did not want to let her in, but she convinced them by explaining the reasons for her choice: she had grown sick of living in luxury while a mass of unfortunates languished in destitution; she reminded them that life on this earth is brief, and that everyone, regardless, must settle his dues with Him who shows no partiality for anyone. The Duke, upon receiving her, went from an initial, embarrassed astonishment to a profound respect for her choice that, she explained, was made with the full will of her spirit, solely for the love of Christ and the poor. After having held audience with her, Sforza charged two members of the senate to support her charitable initiatives. In a consequential part of Milan, there was, nonetheless, an increasingly overt hostility towards Anthony Mary and his group of reformers. Some men of the Church decried scandal because Anthony Mary had associated himself with laymen and even women in this courageous "revolution." 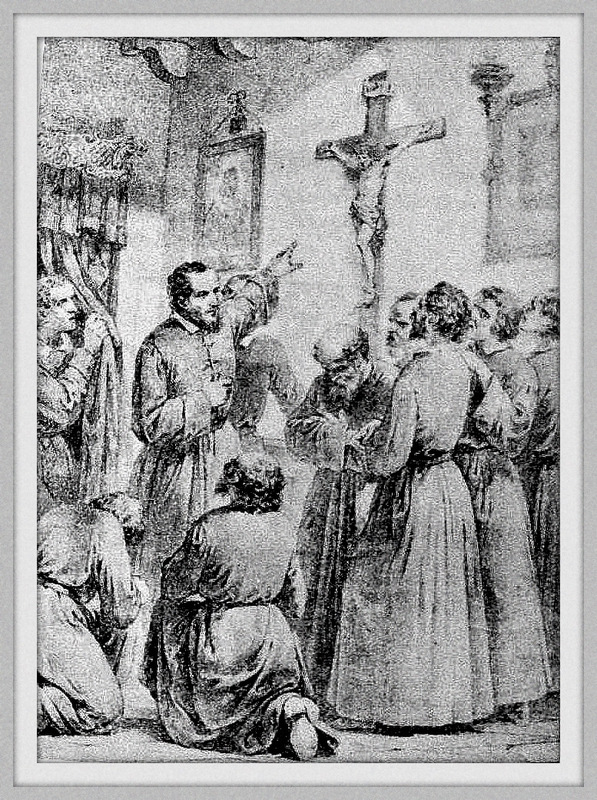 In their opinion, not only was there exaggeration and hypocrisy in those hours passed in adoration before the display of the Most Blessed Sacrament, and in their unusually frequent reception of Communion, but all this boarded on superstition and fanaticism. Especially exacerbating the controversy was that sector of the nobility that considered public demonstrations of penitence by laymen belonging to high-ranking families to be a dishonor to their class. Countess Torelli's family in particular was furious; seeing Guastalla estate, which was to be definitively conferred to the Gonzaga family, slip from their grasp, they accused Anthony Mary of having abused his influence over her. And it was not difficult to implicate other priests in these criticisms as well. And so, from their pulpits they began to inveigh against the new order, forcing the saint to withdraw to Santa Caterina for a while, in fear of worse trouble. His only weapon of defense was prayer, which was incessantly raised up by everyone. To further aggravate the situation, the accusation of Pelagianism crashed down onto the group, probably because of the decisive will and spiritual ardor at the core of Anthony Mary 's spirituality and apostolate. And in those times, being accused of heresy meant risking one's life. In fact, Soresina states, "once, carried away by a greater zeal than usual to speak ill of the Fathers, after having vented a bit, [a preacher] endeavored to persuade the people, that doing violence to the house of the Fathers, they should burn them in their home, saying that they would be making a pleasing sacrifice to God." Anthony Mary's reaction was precisely the opposite of what the hotheads expected: knowing that God was on his side, he exhorted his companions to stay calm, considering it, on the contrary, their good fortune to be able to suffer humiliation for the love of Christ. He spoke of his detractors in a sympathetic tone, asking his followers not to hate them but to generously pardon them, in his certainty that in due time the Lord would derive some good from the bad. But the worst was yet to come: in the autumn of 1534 a man, having put together a dossier of the worst accusations and calumnies against the reformers, denounced them in the senate and the tribunal of Milan, as well as to the local Inquisition. The libel claimed that Anthony Mary and his followers were disturbing the public peace with their new ways and corroding the Catholic doctrine with their superstitious fanaticism. From one court case to another, then. The news was received at Santa Caterina and St. Ambrose with sadness, though with serenity among those whose consciences were clean; they prayed and did penance, confiding especially in the Virgin Mary, while Anthony Mary kept everyone's morale up with his spellbinding words. Father Gabuzio, relating a personal testimony by Soresina, recounts an exhortation that Anthony Mary addressed to his group on October 4 of that same year, just when the storm was reaching its peak. It is a remarkably interesting text inspired by the famous words of Paul, "we fools for Christ," and by the Evangelical Beatitudes. In essence, Anthony Mary says: there is little cause for wonder, or for fear, for as they persecuted Christ, so, too are his disciples persecuted. And here he cites an evangelical excerpt from Matthew (5:11-12), in which Christ affirms: "Blessed are you when they insult you and persecute you and utter every kind of evil against you (falsely) because of me. Rejoice and be glad, for your reward will be great in heaven." Anthony Mary continues, "as you well know, our Savior and heavenly Teacher foretold that similar things would happen to us, so that we would not be surprised as if they were new an unexpected. He confirmed it by His example, so that we would not fear to experience them as unbearable. However, those who persecute us are hurting themselves, because they provoke God's wrath against themselves. At the same time they benefit us, because they enhance our crown of eternal glory. We, therefore, instead of hating and detesting them, have to pity them and love them. Indeed, we have to pray for them […] so that they, seeing our patience and confounded in their iniquity, many return to a better life and be inflamed with God's love […]." Later, a citation from St. Paul: "And didn't our Apostle - the most excellent Doctor of the Gentiles - show himself and the other Apostles, as we have already said, a pattern of derision for us when he said, ‘We are fools on Christ's account... When ridiculed, we bless; when persecuted, we endure.’ (1 Cor 4:10,12-13) Are we perhaps wiser than the Apostles? Are we perhaps, or do we claim to be, in a better position than Christ? Is there anyone of us who thinks he is wiser than the others? But if someone is that wise, ‘let him become a fool so as to become wise’ (1 Cor 3:18). [...] Consider your call, my dear brothers. If we examine it carefully, we would easily recognize that this is what it demands of us. As we have started to follow, though from afar, in the footsteps of the Holy Apostle and of the other disciples of Christ, so let us not refuse to share in their suffering, bearing these trials which are much lighter than theirs. [...]." On October 4 the liturgical feast day of St. Francis of Assisi took place, and Anthony Mary hails the "perfect joy" with which the Poverello (Poor Little Man) used to suffer insults and humiliation. But the conclusion of his discourse is again much influenced by Paul: "Concluding with the Apostle, let us ‘persevere in running the race that lies before us while keeping our eyes fixed on Jesus, the leader and perfecter of faith. For the sake of the joy that lay before him he endured the cross, despising its shame’ (Heb 12:1-2). […] Therefore, since we have chosen such an Apostle as guide and father and have committed ourselves to follow him, let us strive to put into practice his doctrine and his example. It would not be proper that in the ranks of such a captain there should be soldiers who are cowards and traitors, nor that the children of such a great father should be degenerate." In Cronachetta A (Short Chronicle A), an old and valuable notebook of the Barnabite origins, Soresina also records the reaction of those present at the saint's speech: "Such were the words that issued from that angelic mouth of this father, all heated with Divine Love, that he set their hearts aflame, such that all were compelled to lose themselves in the heat of Christ that was penetrating to their cores, and in this way they took to the holy road." In the Cronachetta C he adds, "he inflamed us all in such a way, that we threw ourselves to the ground in a profusion of tears and widespread promises to persevere; and with our hearts swelling we promised God that we would walk the road of scorn." On October 5, the very next day, the senate entrusted the investigation of the Paulines to Gabriele Casati, and shortly after, the diocesan curia and the tribunal of the Holy Inquisition took the incriminating libel into consideration. But, however scrupulous the inquiries were, none of them found the slightest fault in Anthony Mary and his companions: on the contrary, upon examination their perfect doctrinal orthodoxy emerged, irreprehensible behavior, great spirit of poverty, and authentic apostolic zeal. Not twenty-four hours had passed before the senate unanimously confirmed the inconsistencies of the accusations: President Filippo Sacco closed the session with this lapidary affirmation, taken closely from the Bible (Wis 5:4-5): "We are the fools who appraised their virtue as madness, and their aim without honor; they are to be counted amongst the children of God, and their destiny lies with the saints." Anthony Mary, with a noble gesture of charity, not only forgave everyone whole-heartedly, but also insisted that the sentence, which would have shamed the accusers before all of Milan, not be made public. NOTE: Excerpt from the book by Angelo Montonati entitled “Fire in the City: Anthony Mary Zaccaria (1502-1539),” 2002 (unpublished English translation). 2. Sermon 7 - "The Exhortation of October 4, 1534"
"Blessed are you when people revile you and persecute you and utter all kinds of evil against you falsely on my account. Rejoice and be glad, for your reward is great in heaven.”6 As you well know, our Savior and heavenly Teacher foretold that similar things would happen to us, so that we would not be surprised as if they were new and unexpected. He confirmed it by His example, so that we would not fear to experience them as being unbearable. However, those who persecute us are hurting themselves, because they provoke God's wrath against themselves. At the same time they benefit us, because they enhance our crown of eternal glory. We, therefore, instead of hating and detesting them, have to pity them and love them. Indeed, we have to pray for them7 and, as our Apostle warns us, we should not allow evil to control us but instead we should conquer it with good and heap on their heads acts of mercy as so many burning coals of charity,8 so that they, seeing our patience and confounded in their iniquity, may return to a better life and be inflamed with God's love. Let us look, among others, at St. Francis whose feast day we are celebrating, “so that we may not loathe imitating that which we delight in celebrating.”15 In him, in fact, as if in a mirror, there shine the most splendid example of Christian patience, profound humility, and, above all, the most ardent charity. Oh, how ready was he to accept reproaches! How strong in despising himself and the world! How firm when offended, how joyous when scorned! How prepared at enduring the most painful things for the love of Christ! He welcomed all kinds of abuses as the most precious jewels sent him from heaven; to him offenses were far more precious than praises; suffering for Christ's sake was more desirable than being happy in the world. Now he sits the higher and more glorious in heaven, the humbler and more despicable he was to his own eyes and the eyes of others while on earth. And, concluding with the Apostle, "let us also lay aside every weight and the sin that clings so closely, and let us run with perseverance the race that is set before us, looking to Jesus the pioneer and perfecter of our faith, who for the sake of the joy that was set before him endured the cross, disregarding its shame, and has taken his seat at the right hand of the throne of God. Biblical quotations. New Revised Standard Version XL Catholic Edition, 1991. 1. One of these religious, Fr. Battista Soresina (1512-1601) who had treasured this famous speech in his heart, and could later on repeat it almost word for word, did enact it to our second–generation Fathers, among them Fr. Giovanni Antonio Gabuzio (1551-1627), our first official historian, who paraphrased it in elegant Latin in his History of the Clerics Regular of St. Paul (Rome: Salviucci, 1852) 52-56. 3. cf. Phil 3:19. "Their end is destruction; their god is the belly; and their glory is in their shame; their minds are set on earthly things." 7. cf. Mt 5:44. "But I say to you, Love your enemies and pray for those who persecute you." 8. cf. Rom 12:20–21. "No, ‘if your enemies are hungry, feed them; if they are thirsty, give them something to drink; for by doing this you will heap burning coals on their heads.’ Do not be overcome by evil, but overcome evil with good.."
11. cf. 1Cor 3:18 "Do not deceive yourselves. If you think that you are wise in this age, you should become fools so that you may become wise." 13. cf. Ps 66:12. "you let people ride over our heads;we went through fire and through water; yet you have brought us out to a spacious place."